He loves cuddles - does not seem to like the idea of him/her needing to go into cage as he tries everything he can to get out back to my chest to cuddle up and sleep I'd love him loose around my house and most of the time I let him sit on me but have really hard time at night putting him back in the cage - any tips?! 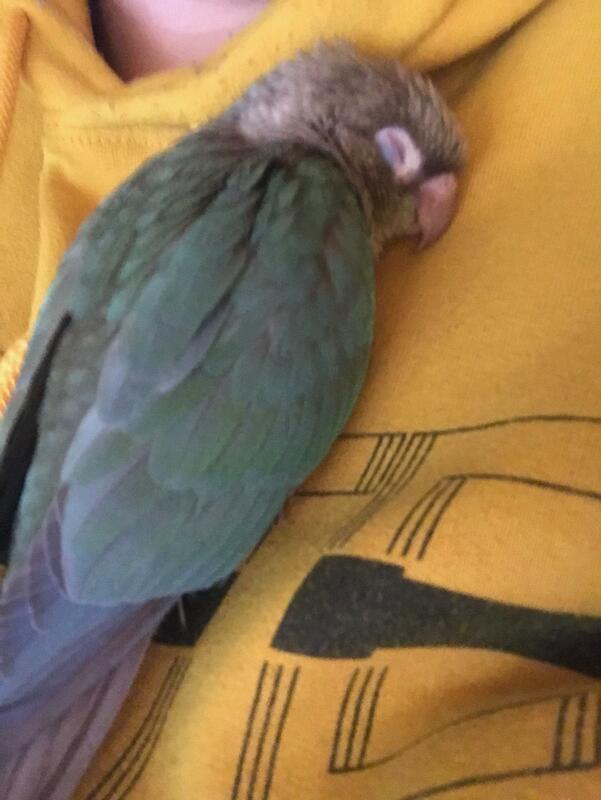 What size cage would be suggested for a green cheek conure? How old does he have to be for us to start training? Any suggestions of treats ? I've read sprouts and bee pollen is really good for the little ones, is this true? Hi! He is already working you! My JoJo was the same way. Cage = treat! Also, so that he learns that cage doesn’t mean end of fun, put him in several times a day and take him back out in a few minutes! Explain to him what you are doing! I know you have a very sweet and new baby, but you want to limit the "cuddles" now. If you set a precedent and overdo it, you will have a hormonal monster on your hands within the near future. Stick to petting on the head only. Make sure that you build trust---solid trust...3 days is NOTHING in bird time, but this is a very young bird, and they are bound to be more trusting--nevertheless, there tends to be a weird honeymoon period in which birds are both scared and seemingly "loving" (do not let this trick you into assuming that you guys have a solid bond already-- I mean, you could, but 3 days is VERY early to have established real trust). ..Observe, observe, observe, because when they hit puberty, they change and you have to be an expert at reading their signals, and you must have already established independence and boundaries or your relationship will be misinterpreted as sexual and things will get bad. If you have any snuggle huts, boxes, pillows, shadowy ledges, or allow your bird under clothing, stop that ASAP (and remove any huts etc from the cage). These places create hormonal issues and health problems and they have no business in your bird's life (no matter how much they love them). Last edited by noodles123; 04-16-2019 at 06:43 PM. I like your style already! Open-minded, friendly... you're gonna fit right in. My main concern is the age...Green Cheeks don't fully wean until they are 12-13 weeks old, so either your bird is much older than you were told, or you are hand-feeding him formula...If you're hand-feeding him, then do you know all about the proper ambient and formula temperatures, feeding schedule, how to feed him properly without aspirating him, etc.? Yes according to the seller fully weaned, with my little experience I wouldnt know myself but he/she is not shy around food and taking care of himself. I struggle even more now with him being in the cage - he climbs up all the bars and sticks near the cage doors as soon as I get in the room, once out he flies or climbs up on my chest or face to cuddle up and sleep, demands petting by chirping as well and I i dont give head rubs he shows attitude, chirping and i dont know how to describe it but he kinda shows that he's not happy with his voice and wings. Have you taken him to a Certified Avian Vet to verify that he is healthy and that he is indeed weened? Additionally, you can get a bird scale (or attach a t perch to a scale and account for the added weight) then you can weigh him every other day or so to ensure that he isn't losing weight. Without medical information, it is hard to advise you because an unweened (or partially weened) baby is going to behave differently and have different needs than an older bird. Do not hold him as much---You need to establish a healthy routine and independence. Teach him to play with toys and don't come running if he screams for you because you aren't attending to him. Do not approach until the screaming stops (guessing this will happen if it hasn't). You can try target training to get him to stay on a perch in the room unless called, but it's too early for that. Still, don't pick him up every time you are in the room etc or he will expect it. Will he hang out on the cage top (open) without flying off? You definitely cannot go to him every time he wants you....You should focus more on play and less on cuddles if you can. He is going to get into a cycle of expecting this and it will become unhealthy when he matures. Last edited by noodles123; 04-19-2019 at 06:53 AM. Sounds like he's begging to be fed formula. My Finley did that exact thing and he wasn't fully weaned and looked like he was eating solid foods but at a closer inspection he was just eating like one soft fruit very slowly and tossing most the food on the floor of his cage. Please take him to a Avian Vet.